Armchairs, a pair, mahogany, cotton velour with period metal lace trim, elaborately-carved, Renaissance Revival style X-frame armchairs with striated red cotton velour seat cushions (c, d) with 2 5/16" wide metal lace trim and four tassels (now mostly missing). 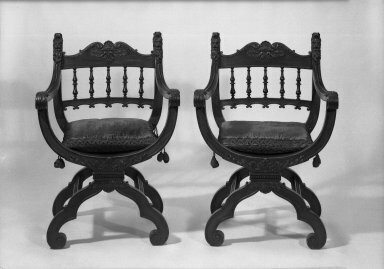 Chairs with U-shaped seatback and crest rail of two s-scrolled acanthus leaves which meet at central carved shell and acanthus leaf decoration over 5 turned spindles with stacked souble balusters supported by straight rail with elongated horizontally-placed c-scrolls below. Carved grotesque bearded mask heads at top of stiles which descend into molded arms terminating in scroll handholds. Concave seat with acanthus decoration below seat front followed by molded horizontal band with vertically-placed gadrooning (beading) and acanthus and shell decoration below. Double c-scrolled front and rear legs joined by straight reeded stretchers terminating in scrolled feet.